The fact is the time to start thinking about college is when you are selecting your freshman courses. It can be argued that it begins much earlier than this even – through the development of soft skills like time management, study habits, and a growth mindset for example, but that is a different post. 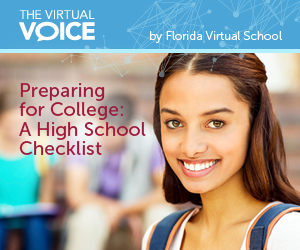 We will focus here on a few practical things that students should do each of the four years of high school to be better prepared for the process of applying for college, paying for college, and staying in college. This is by no means an exhaustive list, but rather highlights for each high school year. As mentioned, the above are only highlights. Below are links to additional, more exhaustive resources, and remember, the FLVS School Counselors are here to support you in this process as well! NACAC consists of nearly 13,000 professionals from around the world dedicated to serving students as they make choices about pursuing postsecondary education. They offer extensive resources for students and parents. A resource of the U.S. Department of Education, College Navigator gathers admission, retention, graduation, and financial aid data for every college in the country. This entry was posted in Full Time Edition, Homeschool Edition, Student Edition and tagged Advisement, college, college planning, College Preparation, Determination, Goal Setting, Goals, Grit, Leadership, Motivation, Perseverance, Positive Impact, Role Models, Student Achievement, Student Success, Success on July 3, 2015 by Amy LaGrasta.